I'm proud to announce that in March Oracle promoted me from Oracle ACE to Oracle ACE Director! It was an arduous road to get to celebrate this promotion. I thank all my family who supported me unconditionally in all these years, also my friends, colleagues and those who follow me because they have contributed to my professional growth and today I can enjoy this achievement. I also want to thank the ACE Program for giving me this new opportunity to continue giving the best of me and share my experiences and knowledge with the community. Before sharing my experience on the path to obtaining the Oracle ACE Director award, I would like to introduce what the Oracle ACE Program is. 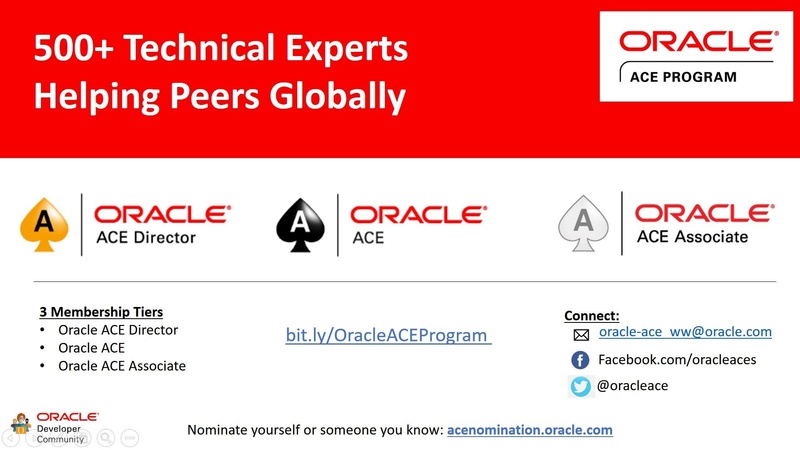 The Oracle ACE Program highlights excellence within the global Oracle community by recognizing individuals who have demonstrated both technical skill and strong credentials as enthusiasts and community advocates. Now that we know what the ACE Program is about, I want to share some tips that have helped me achieve this recognition by Oracle and might help you as well, regardless of the type of Oracle technologies you are using. Share your knowledge with the community. There are different ways of doing it; for example, creating a blog about the Oracle technology that you use on a daily basis. Answer questions in the Oracle forum, which can also be a pretty good way in making yourself known as an expert. For this, you need to have a free Oracle account first and then follow the forum. There are forums in several languages, including Spanish and English forums. Find out whether there is an Oracle Users Group in your country and area and contact them to be a member or volunteer. There, you can help your community create new events and grow the community of users of Oracle technologies. If there is not an Oracle User Group in your area, look for friends who share your passion for Oracle technologies and with whom you can create a User Group with for your country. Start participating as a presenter and/or organizer of small events in your community and then when you achieve notoriety, go to participate in large events such as the OTN Tour, which is changing its name this year to LAD Tour 2018. This event is organized by the different User Groups of Central and South America as well as Oracle OpenWorld, the largest Oracle technology event in the world, which is held every year in San Francisco. Write technical articles on your specialty to be published in the Technical Articles section of OTN. We have other ways to connect and hold events in our community, such as creating a Meetup Group in which you are the organizer and can hold periodic events for your members, whether they are face-to-face events or virtual events. If at the beginning you can’t go to a face-to-face event as a lecturer, try doing webinars for the different user groups in your country. Doing that will give you a lot of visibility in the online community and you will continue to grow as an expert in your area. If you like to write, buck up and write a book about your experiences and knowledge in your field of profession. Search your area for events related to your expertise and actively participate in them so that the community can get to know you more. Another way to share your knowledge is using social networks. They will allow you to reach the whole world and you can also follow the experts in your area to learn from them, too. If you like to teach, a way to deliver knowledge is through video tutorials. Whether you post on YouTube or Vimeo, this will also bring you closer to your community, which will begin to recognize you as an expert in your area. Now, if you like to talk, I advise you to learn how to create Podcasts, since this type of content is booming for the cyber community in general. Finally, but no less important, find a mentor in your area of knowledge to be the image of where you want to be and see what they have done so you can follow their steps by adding your own creativity on the way. In short, it's about loving what you do and when that happens, you will see how much you will want to share that passion with everyone! Those are my tips, and now I’ll follow up with my personal story. Of I my experience progressing towards obtaining this great recognition, Oracle ACE Director. There are thousands of different ways to obtain the ACE but in my case, everything started in 2009 when my friend and colleague Gisela Velazco visited me in Tampa, Florida – USA. During her stay, she introduced me to Oracle technology; more precisely, the administration of Oracle databases. I came from the world of Microsoft, where I programmed in Visual Basic, but at that point in my life I wanted a change, and that's how I started this journey. For several months, I learned from her how to create different self-taught scenarios and laboratories for database administration. I continued studying and practicing while I worked as a freelancer developing websites with WordPress. When I started researching APEX, I did not understand how an application could be developed without writing a line of code. Being so used to programming with Visual Basic, this was something I could not believe! It was a whole new world for me and I began simply playing with the tool to learn more about it. I would buy every book that was published by Application Express (and still do it), and I also had several virtual machines with APEX installed, on which I would practice daily and study everything that I could. In 2011 Gisela and I started our blog in Spanish: "Discovering the Oracle World (Descubriendo el Mundo Oracle)" where we shared articles about database administration, SQL queries, and later development with Application Express. 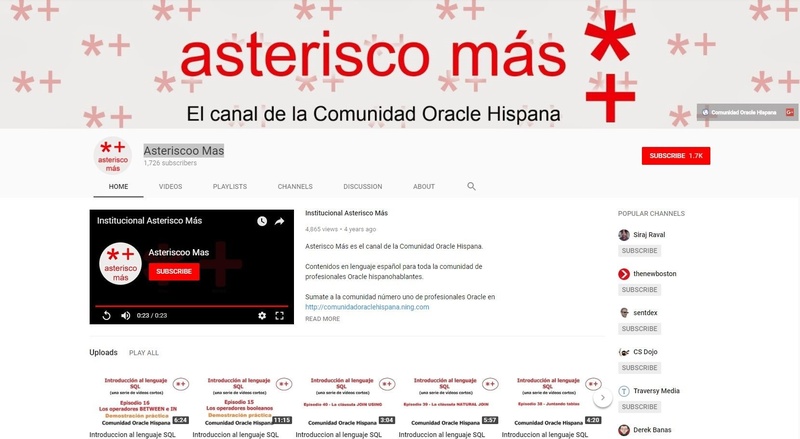 In that same year, I became a member of the Oracle Hispanic Community; a community focused in bringing together all Spanish-speaking users of Oracle technologies to share their experiences and assist in the consultations of other members (no longer extant). I met the founder of the community, Fernando García, with whom we created a great friendship, and in September 2011 we started the production of the Podcast "The Oracle Hispanic Community Show ". This podcast was dedicated entirely to the Oracle technologies, and we delivered the knowledge in a fun and very instructive way. We recorded 18 podcasts and it was one of the projects that I had the most fun doing. When 2012 began, I was presented with the great opportunity to work in a company that had specialized in Oracle products for almost 20 years, called Skillbuilders. I was in charge of the development of instructional materials in Spanish on Oracle Application Express. I was able to meet two APEX experts, Dan McGhan and Jorge Rimblas, who was my instructor in the two APEX courses I took as part of the training the company gave me. I kept sharing my knowledge through the blog and then with the podcasts. In February of 2012 I joined with a group of friends: Gustavo Gonzalez, Marcelo Ochoa, Marcelo Burgos, Gerardo Tezza and Fernando García to found the Oracle Users Group of Argentina - AROUG. That same year I participated in my first OTN as an organizer for the Oracle Users Group of Argentina and sponsored by SkillBuilders, visiting Uruguay, Brazil and Argentina. That was a great experience for me and I decided that one day I would be a speaker at that event. In 2012, we organized the first Oracle APEX Tour Latin America with the participation of user groups from Argentina, Uruguay, and Brazil. It was a success! In the following year, more countries joined the Tour, such as Costa Rica and USA, where I organized a local event in which I was a presenter with Oracle ACE Director Raj Mattamal. In the following years we continued working on the organization of the Oracle APEX Tour, until in 2016, when it changed its name to "Oracle Developer Tour" to incorporate more development technologies in the event. Last year, 2017, was the last event in which I participated both in the organization and in the hosting and maintenance of the website. After five years of the event, we were proud that nine countries participated, with the support of the User Groups of Argentina, Brazil, Chile, Colombia, Costa Rica, Ecuador, Mexico, Panama and Paraguay. It was a great phase, since for five years among all the groups of users participating in the event, we were able to make known Application Express and other development tools for Oracle Databases. In 2013, I embarked on a new path: owning my own business. For this reason, I founded my current company, ClarTech Solutions, Inc., dedicated to consulting, development, and training on the Oracle and Open Source technologies. Later, in 2014, alongside Fernando García, we created a completely free course named "Curso de Lenguaje SQL" available to anyone who wants to introduce themselves to this language. The YouTube channel that has the free videos is called Asterisco Mas. Every effort and dedication has its prize! 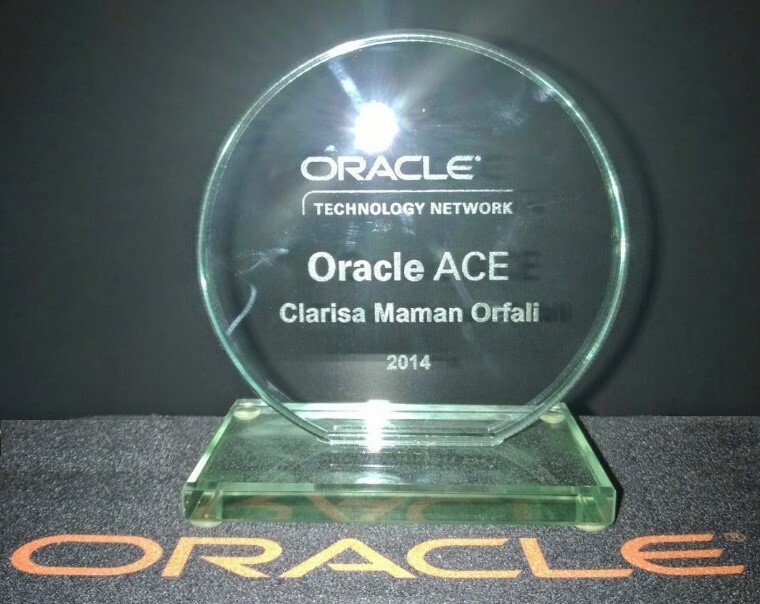 By August of 2014 I received the great news of being recognized by Oracle and I became Oracle ACE. I continue to participate in events such as the Oracle Open World in 2014, where I first attended the Oracle ACE dinner, which was an unforgettable experience! In November 2014 I founded the "Oracle APEX Latin America" Meetup Group to share another excellent tool with the community that conducts online meetings. This group was active until the end of 2017. In 2015, I became an expert member of the Toad World platform where I regularly write about Application Express issues and the use of the "Toad for Oracle" product. 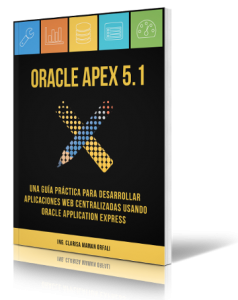 In November of that same year, I launched the first book in Spanish on Amazon about Application Express entitled: "Introducción a Oracle APEX 5.0", in Paperback and Kindle format. 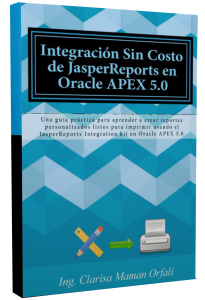 For January of 2016, I launched my second book entitled "Integración Sin Costo de JasperReports en Oracle APEX 5.0" dedicated 100% to the printing of personalized reports in PDF format using the free JasperReports Integration kit. In that same year, I developed an APEX 5.0 application for the whole community, which I called the "Aplicación Demo CMO" with all the APEX examples that I wrote on the Toad World platform. 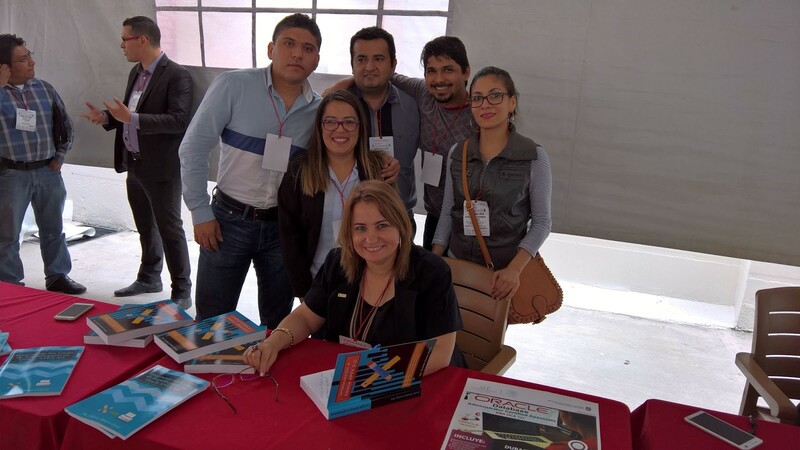 On August of the same year, I had the pleasure of participating at the OTN Tour of Mexico, which presented me with some unforgettable moments and the great satisfaction of seeing how many people knew about Application Express already. In addition, I had the pleasure of enjoying a moment to sign autographs of my books for all Application Express fans! 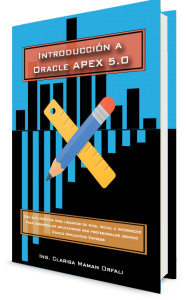 By the year 2017, I had the great joy again of publishing a new book on Amazon called "Oracle APEX 5.1". From then to today, I continue to share my knowledge writing articles on my blog, recording more than 50 videos on my YouTube channel, creating eight online courses in my academy, presenting different webinars, and publishing seven technical articles on Oracle Technology Network OTN. This journey has given me much satisfaction and I have also have had many learnings and challenges. I know that this is not over, I will to continue working for my community and share my experiences and knowledge with all Oracle Application Express fans.